Creating a Bold New Economy: An Idea Incubator for Franklin County’s Future will explore new business models that will help us all thrive in Franklin County. The forum will be kicked off by Marjorie Kelly, author of Owning Our Future, and former editor of Business Ethics magazine. Kelly is also co-founder of Tellus Institute’s Corporation 20/20, which explores creating new ways of doing societal good while building thriving businesses. A panel of local leaders from FRCOG, CDC, Greenfield Cooperative Bank, and the Franklin Community Cooperative will comment on the applicability of Kelly’s ideas to Franklin County. In the afternoon working groups will explore Financing the New Economy; Creating a Living Wage Economy; Food as an Economic Engine; Building an Authentic Cultural Identity; and Thinking Like a Region. Organized by Greening Greenfield and co-sponsored by CDC, FC Chamber of Commerce, FRCOG, Franklin Hampshire Regional Employment Board, PVGrows and others. Saturday, Nov 15, 8:30-3:30 at Greenfield Community College. $25 registration fee includes lunch and refreshments. $15 discounted rate for CDC members, students and low income. For more information and to register go to www.GreeningGreenfield.org and look under “Events” or call 413-773-0228. The next pvSustain membership meeting will be on November 7th, from 9:00am to 11:00am, in the first floor conference room of the John W. Olver Transit Center, 12 Olive Street, Greenfield, MA. The next pvSustain membership meeting will be on November 7th, from 9:00am to 11:00am, in the first floor conference room at the John W. Olver Transit Center, 12 Olive Street, Greenfield, MA. 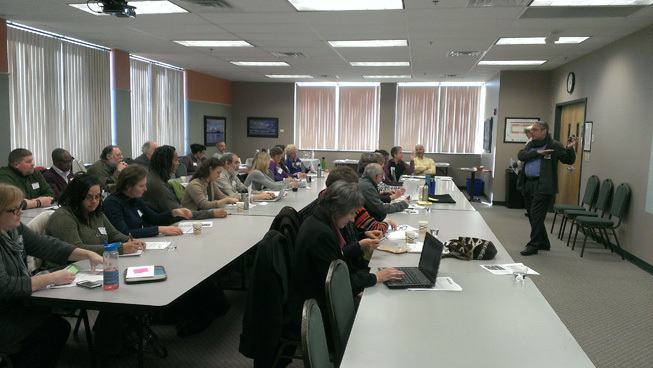 T hank you to everyone who attended pvSustain’s “Change Makers: Hone Your Skills” workshop on Wednesday, January 29th. Over 40 people, including municipal officials, non-profit leaders, and sustainability professionals attended the skills building event. The event included a keynote by Professor Joseph Krupczynski of the UMass Center for Design. As part of PVPC’s development of the Sustainable Knowledge Corridor planning project, Joseph and his students worked with PVPC, the United Way Pioneer Valley, and Hampshire County United Way staff to assure participation of residents who are too often left out of traditional planning processes. The event also included small-group workshops led by Eric Weiss of the Hampshire Council of Governments, Paul Lipke of Health Care Without Harm, Lora Wondolowski of Leadership Pioneer Valley, and Lynn Benander of Co-Op Power. pvSustain members share a vision of a future for the Pioneer Valley that will be worth the struggle in the difficult years that we all know lie ahead. In this future,diversity is cherished and protected within the human community and beyond. The inhabitants of the Valley’s cities, towns and countryside enjoy access to the clean air, the water, the food and the human support fundamental to good physical and mental health. They possess the information and the skills needed to meet the challenges of their day, and their communities are able to control many of the important decisions that affect their daily lives. The health, diversity and population levels of plants, animals and other life forms, both domesticated and wild, are treated as a sacred trust. pvSustain members work to support this broadly shared vision in many different ways. Some seek to create environmentally sustainable transportation, some to ensure that education from basics through to needed specializations is available, some to support regional food production and distribution and other basic economic activity, some work for clean air and water, some to create and distribute needed information, some to ensure that relevant basic science is carried out, some work for land and wildlife preservation, and some to ensure the development of effective structures for self-governance and regional collaboration. Active collaboration and information-sharing among pvSustain members as well as between members and the broader community can and must play an important role in moving the Valley toward this desired future. Our purpose is to foster dialogue and collaboration. We make decisions by consensus of the members present at our meetings about how and when to meet, what initiatives to take on, and how to complement them. We have agreed not to become another organization with staff competing for funding, but remain a community of professionals (paid and volunteer) working in sustainability who pay dues to support our collaboration, as a project of the Pioneer Valley Planning Commission. pvSustain now has over 100 member organizations and individuals. We have one paid part-time staff position, in addition to the two paid part-time researchers who secured the original funding. A volunteer Chair facilitates meetings, a volunteer steering committee helps set agendas, and ad hoc committees emerge as needed to work on time-limited projects. The work of pvSustain is informed by a number of leading thinkers and practitioners in the field of sustainability. Among these are William McDonough and the Natural Step Framework. pvSustain is a work in progress. Here are some resources we have used as we articluate who we are and how we function as a network of sustainability professionals in the Pioneer Valley region of western Massachusetts. —David Korten, co-founder and board chair, YES! Magazine.